The Food-Minded Mama: Oh Yes She Did!! I love Trader Joe's. 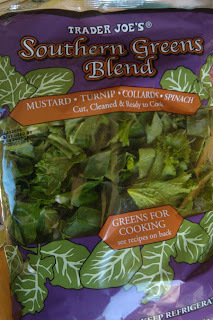 On this occasion I love them for having a giant bag of Mixed Southern Greens all cut up and ready to cook. I recently got a store-bought roasted chicken (one of my standby's) and knew I needed something green to put on the plate. Seeing that the point of buying something that's hot and ready to eat is to not have to cook much more, I threw that bag 'o greens in a pot and covered it up while I pulled that bird from limb to limb. Now I wasn't sure if Lorelei would eat those greens, but I'll tell you what, not only did she eat what I gave her, she took from my plate, asked for more, had some for breakfast and wanted some to go to daycare with her for lunch. Did she like it? Oh yes she did! Over medium high heat, sautee the onion in the olive oil in a large stock pot until translucent. Fill the pot with the coarsely chopped. With a pair of tongs, turn the greens top to bottom a few times to evenly distribute the heat. When the leaves have wilted significantly, add the vinaigre and stir to distribute. At this time, add the chicken stock and cover to cook for 10-15 minutes at Medium Heat. Serve with a pinch of coarse salt.